This weeks trash pickup will be the start of also picking up the Tan Yard Waste containers. This pickup will continue on the LAST PICKUP of each month through the month of October. The Keep Penbrook Beautiful event is tomorrow, Saturday, April 13th, 10am-noon. Please arrive at the borough building by 10am to register and pick up your gloves, safety vests, and bags. The double blue doors on the parking lot side will be open. Please review the safety information attached prior to arriving Saturday morning. A map is also attached highlighting the streets that need cleaned up. We will also clean up the parks. Please let us know on Saturday which area you prefer to clean up. After we collect the litter, we will place the bags in front of the dumpster at the Public Works building on Market Street Road by 12:00pm. Please don't place your bags in the dumpster because we need to count them first. If you'd like someone to pick up your bag and take it to the dumpster, please send a text to ‭‭(717) 992-7635‬‬ with the location of your bags and we will send someone to pick them up for you. Thank you again for making time to help pick up litter in Penbrook. 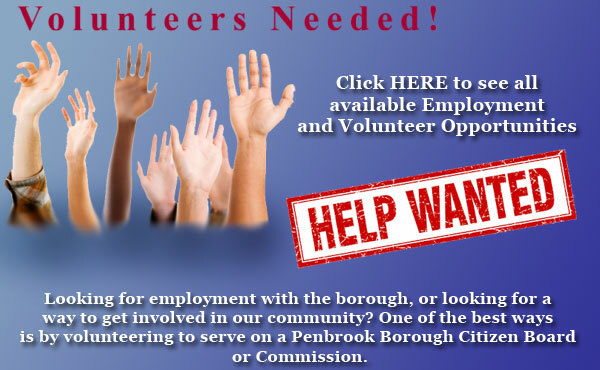 Together we will keep Penbrook beautiful! Here are a few pictures from last year. Please feel free to email pictures from this year's event. Awesome! Couldn’t have been given to a better guy! Congratulations Joe and family!!! Way to go, Joe!! Congrats!! Remember when all officers and the chief lived in Penbrook? Congratulations Summer! You're on the right path! Summer I am so very proud of you! HARRISBURG (March 29, 2019): Capital Region Water will begin its annual fire hydrant flushing and inspection program on Monday, April 1. It is expected to take six to eight weeks to reach all 1,800 fire hydrants in Capital Region Water’s service area. Annual fire hydrant flushing and inspections are vital to maintaining high quality drinking water. Flushing removes buildup in fire hydrants and water mains. Crews also inspect each hydrant to ensure reliable use for fire protection. Capital Region Water quickly repairs any issues with fire hydrants to keep them in service. Over 70 fire hydrants were repaired or replaced in 2018. Fire hydrant flushing may cause a temporary discoloration of water and a temporary reduction in water pressure. The discoloration is not harmful and can be flushed by running cold water through a faucet, preferably at the highest point in their residence. Customers can call 888-510-0606 or email info@capitalregionwater.com with any questions or concerns. Flushing will take place in several phases and will begin near Reservoir Park and progress out toward Capital Region Water’s service area boundaries. Customers can check the progress of hydrant flushing on Capital Region Water’s website at capitalregionwater.com/hydrantflushing/. Customers can sign up to receive automated messages about hydrant flushing by subscribing to “Service Alerts” at capitalregionwater.com/alerts/. You can also sign up over the phone by calling Capital Region Water at 888-510-0606. Annual Children’s Easter Egg Hunt. Ashly Stepp please be careful if you’re up at home! Penbrook Fire 30 shared a live video. Penbrook Police Department shared a link. The logo appears to be for a Heating & Cooling company with the company name below.